Lodge Brothers Funeral Directors in Ashford held their annual Christmas Memorial and Thanksgiving Service recently. 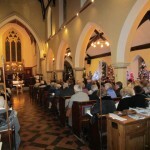 The service, which took place at St Matthew’s Church on Sunday 14th December, was attended by over 180 people who have experienced bereavement in recent months. They came along to remember their loved ones, give thanks and light a candle in a moving hour-long service led by Father Stuart King and arranged by Lodge Brothers’ District Manager, Richard Leachman. St Matthew’s Church choir sang, ably led by organist Philip Buckmaster, and local musician Robert Goodhew played a beautiful piece on his saxophone. Afterwards, refreshments were served by Lodge Brothers’ staff.